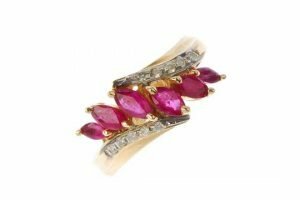 A ruby and diamond dress ring, the marquise-shape ruby curved line to the single-cut diamond asymmetric shoulders and plain band. Estimated total diamond weight 0.10ct. 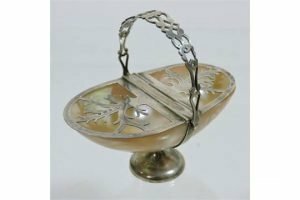 An Edwardian silver and mother of pearl spoon warmer, of basket shape, Birmingham 1908. 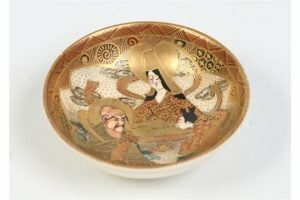 A Japanese Satsuma miniature dish. Decorated in enamel and gilt with deities. 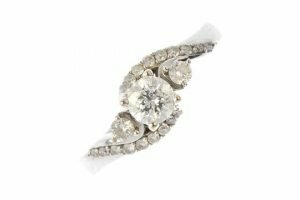 An 18ct gold diamond three-stone crossover ring, the brilliant-cut diamond graduated line to the similarly-cut diamond curved line asymmetric sides. 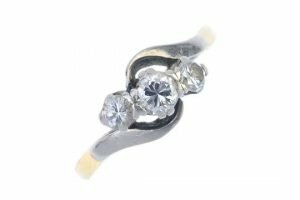 Total diamond weight 0.75ct, stamped to band. 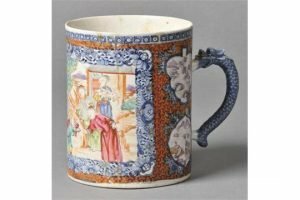 A large Chinese Export porcelain mug decorated with a large vignette of figures on a terrace, late 19th century, under glazed blue with polychrome painted decoration. 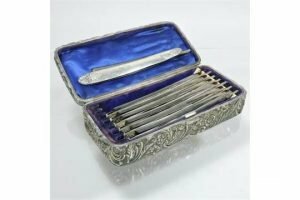 A set of seven Edwardian silver handled cut-throat razors, each steel blade engraved for the day of the week, by Joseph Rodgers and Son, in a fitted silver box. 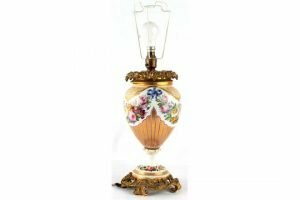 A 19th century Paris porcelain floral painted vase, adapted as a table lamp with ormolu mounts. 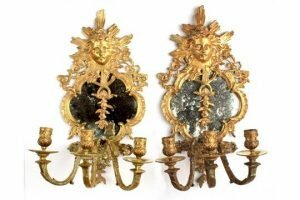 A pair of late 19th century French ormolu and gilt brass three-light girandoles, of Regency style. 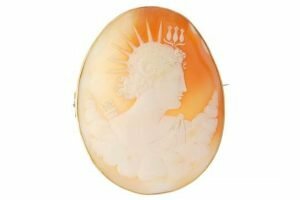 A mid 20th century shell cameo brooch of oval outline, carved to depict a mythical figure. 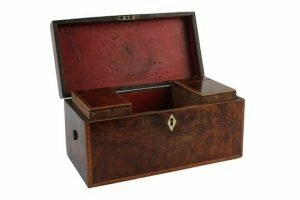 An early 19th century George III mahogany & kingwood cross banded rectangular tea-caddy, with two lift-out tea canisters flanking a well. 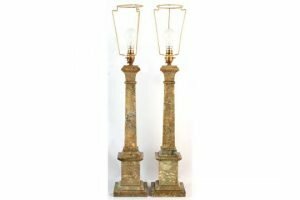 A pair of green soapstone square section Ionic column table lamps, each 20ins. 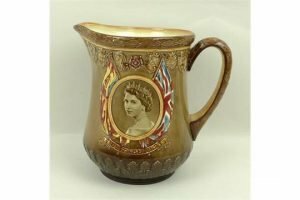 A Royal Doulton pottery jug, commemorating the coronation of Queen Elizabeth II at Westminster Abbey, June 2nd 1953, decorated with a circular profile of Her Majesty flanked by the Royal Standard and Union Flag, beneath coats of arms. 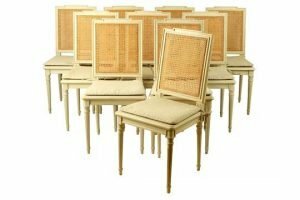 A set of ten French Louis XVI style cream painted & cane panelled side chairs. A mid 20th century gold diamond three-stone ring of bi-colour design, the graduated circular-cut diamond line, to the asymmetric shoulders. Estimated total diamond weight 0.45ct. 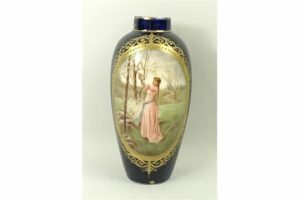 A Vienna style porcelain vase, late 19th century, of ovoid form, reserve painted with an allegorical scene against a gilt tooled, cobalt blue ground. 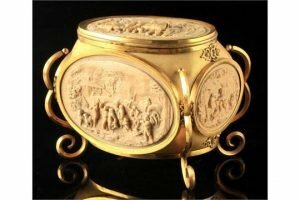 An early 20th century French ornate gilt metal casket, with relief decorated composition oval panels depicting country scenes. 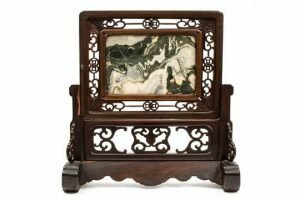 A Chinese marble and wood screen stand for the scholar s table, 19th or 20th century, the attractively veined marble reminiscent of a mountainous landscape. 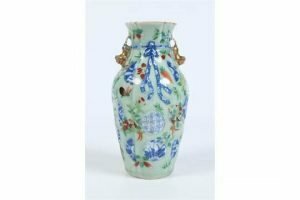 A nineteenth century Chinese celadon vase with pleated moulding to the neck and having twin moulded handles. Painted with underglaze blue roundels and in coloured enamels with fruit and birds. 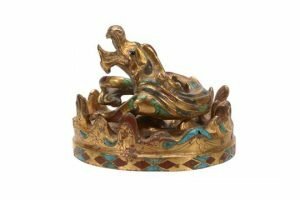 A Chinese Han-style gilt metal dragon and stand, inlaid with coloured stones, the dragon with open mouth and coiled, the circular stand with flame border. 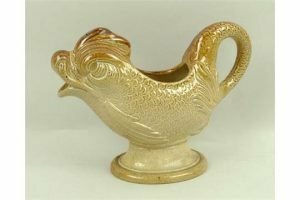 A salt glazed stoneware sauce boat, early 19th century, modelled as dolphin raised on an oval, pedestal base.